When U.S. Attorney General Jeff Sessions quotes the Bible to support policies intended to keep many migrant families out of the country, the Rev. Nancy Frausto reacts like some of her fellow faith leaders. She wants him to stop. But more so than for other clergy, the stakes feel especially high. 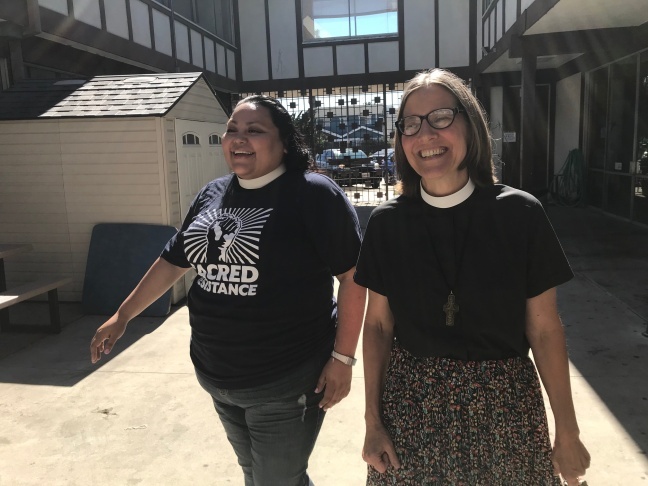 Frausto, associate rector at St. Luke's Episcopal Church in Long Beach, is undocumented, one of a few known "Dreamer" priests in the entire country and perhaps the only woman in this group. Now 35, Frausto was brought to Los Angeles from Mexico at age 7, escaping what she said was poverty and violence in Mexico like many of the families now being stopped at the border have described. During a recent Sunday, Frausto reminded her congregation that "they are our brothers and sisters." She implored them to "take Christianity back" from those like Sessions who cite the Scripture in support of tougher immigration policies. 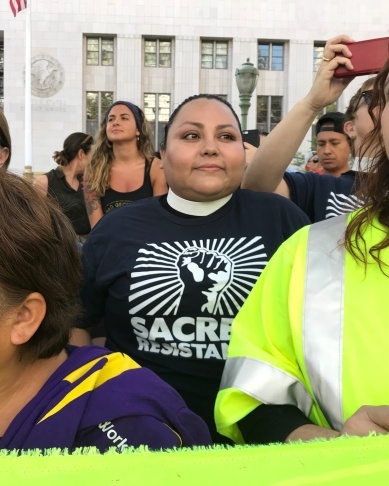 "We have allowed our faith to be hijacked by domestic terrorists hiding behind three-piece suits and the Bible," Frausto said in a sermon met by applause. Frausto's family settled in Highland Park, where she strengthened a connection to God at a young age. "I was that kid on Saturday morning who would wake up early, clean my house, set coffee for the Jehovah's Witness because we were going to talk about God," Frausto said. She befriended the Mormons who came by, too. But it was the Episcopal church in her neighborhood that felt most welcoming — to immigrants, the poor and the LGBTQ community. At 16, she declared to her family she was going to be an Episcopalian priest. Her Catholic parents were happy once they got over the surprise that, in the Episcopal Church, women can be priests. Frausto went to seminary at the Claremont School of Theology. But she was worried — what parish would hire her, an undocumented priest? Then in 2012, the year she was ordained, President Obama introduced the Deferred Action for Childhood Arrivals program or DACA, which lets immigrants brought here as children to work and stay in the country temporarily. At 29, Frausto just made the age cut-off. "That was my moment where I was like, 'Oh, my God! God, like you are so good," Frausto said. She found work at two parishes in Koreatown and East Hollywood before St. Luke's came calling. 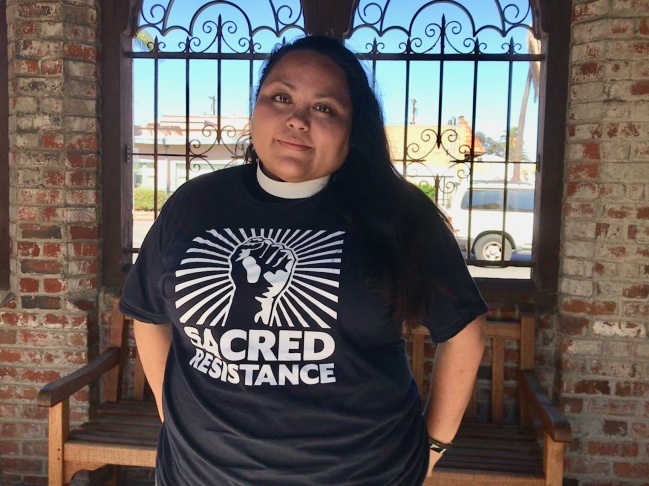 She had heard of how the church offers sanctuary to immigrants facing deportation. "That's a place that is talking the talk and walking the walk," she thought. "I must be there." Fraustro works on the church's sanctuary program, which is currently housing a 29-year-old asylum applicant from Honduras. She also leads services in English and Spanish. 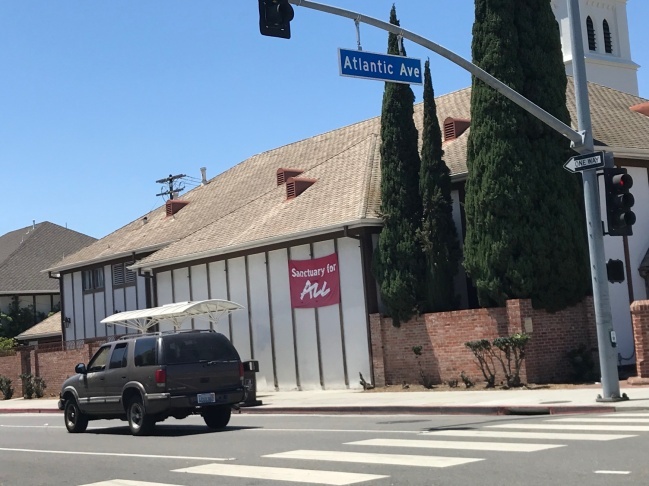 The congregation is predominantly white but leaders are working to grow their numbers among Long Beach's large Latino immigrant community. The Rev. Jane Gould, St. Luke's rector, said that Fraustro has built trust among the congregation's undocumented members. "She is their pastor," Gould said. "She'll stand with them if they're documented or undocumented." Last fall, within months of Frausto going to St. Luke's, her life fell into disarray. Attorney General Sessions announced that DACA would be rescinded. Frausto started to craft a letter to the church's board saying she understood if they wanted to fire her. Church member Ann Burdette says dismissing Frausto was never considered. "We would ever never want to lose the gift that she's brought to the parish," Burdette said. Burdette says congregation members aren't sure how they would protect her if her legal status under DACA is not renewed when it expires next year, but that they would figure out a way. "I don't know that we've always had a tradition in the Episcopal Church of outspoken priests," said Burdette, a retired teacher. "Her courage translates into my being more courageous." Frausto has helped keep immigration front and center with her congregation. She's glad to see many Americans speaking out against the detention of migrant children and their families. "But if I'm being honest," Frausto said, "I'm also angry that it's taken so long for people to pay attention, and I don't want for this to become like a passing phase." Last Tuesday, Frausto was in downtown L.A. with hundreds of activists to keep the pressure on Sessions, who was in town for the day. More than 20 activists, most of them clergy members from the faith coalitions Clergy & Laity United for Economic Justice (CLUE) and LA Voice, blocked Spring Street in front of the federal court house. Sandra Olewine, a Methodist pastor from Pasadena, was the first to be arrested. "You got to break the law to stand up to the law," Olewine said minutes before she was cuffed by police. Frausto watched from the sidelines, her face mixed with emotion. She wanted to take part — but an arrest could lead to her deportation. "I'm torn right now," Frausto said. "There's pride for them and also guilt that I can't do it because there's that part, I'm looking out for myself, right?" She prays for a time when she can freely practice civil disobedience. But she also calls herself a realist. There's a sad joke she tells, that one day she could be needing sanctuary at her own church. Editor's note: A version of this story was also on the radio. Listen to it here.